Spent two weeks here and was very happy. The apartment is on the fourth floor so there are a few flights of stairs but if you're okay with this you get an apartment 20 yards from the beach. Two streets down from a supermarket and virtually next door to the best seafood bar in Fuengirola. The apartment is basic but more than adequate and nicely decorated. It has a great terrace. Good internet access although I did have to top it up but that was due to the work I was doing on my laptop. Highly recommended. Slight problem with the door key but that was resolved quickly. I will stay there again as the location is so good. Wonderful place in the middle of Fuengirola. Nice appartement With all you need for your stay. Neal the SEA, shops and bars. Highly recommendable. Thanks Lone. You're most welcome next year! Excellent value. So glad we booked the apartment. The position of the apartment is ideal. Just one row back from the sea and the trendy tapas bars and restaurants are on its doorstep. Local shops including a fishmonger, baker, butcher and a small supermarket are close by. The apartment was perfect for my husband and I and although the kitchen is small it is very well equipped and functioned extremely well. The bathroom also has a good sized shower. 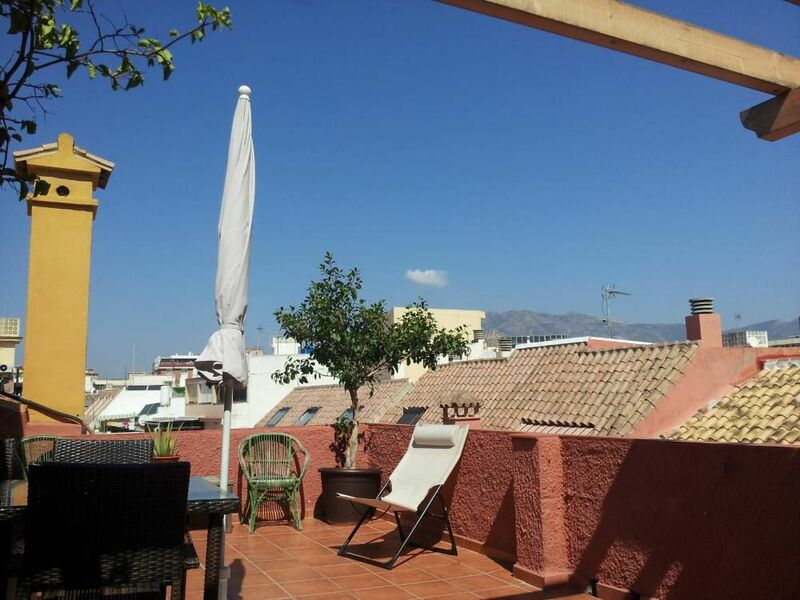 The main attraction though is the roof terrace which is large, comfortable and a delight to sit out on. The apartment is on the fourth floor and there is no lift. We saw this as a challenge and felt a lot fitter by the end of our stay! Thank you so much Lynne and welcome again tomorrow. Enjoy your new stay there ... feeling at your place. Good communication with the owner prior to our stay, very helpful agency staff managing the apartment just a 5 minute walk away, on hand should you require their assistance. The apartment is just a minutes short walk from the nearest supermarket and beach where many restaurants and bars can be found. Although the more 'Spanish' square 50m away from the beach was a much nicer place to watch the world go by with it's traditional tapas bars and hustle and bustle of the locals, A wonderful rooftop terrace made the apartment for us when we stayed, perfect for an evening spent with a bottle of wine and a meal. Basically furnished, however everything we needed to hand except a kettle for boiling water but hardly a complaint overall. Be warned though there are several flights of stairs leading to this apartment (no lift facility) so not for everyone but for our requirement this was not a concern. Having stayed in various accommodation in Fuengirola over the last several years we found this to be the most relaxing spot by far.